Lacrosse Arrives at Painted Rock Academy! 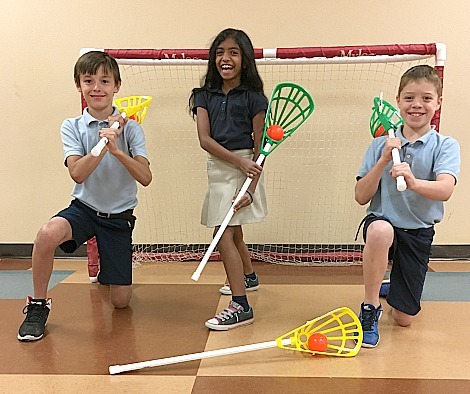 This fall, Painted Rock Academy students in third through eighth grades will be playing lacrosse in PE. 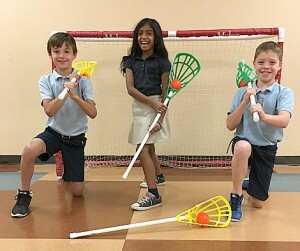 Coach Teri Hunt applied for and received a grant from US Lacrosse, giving the school a full set of equipment including a net, 30 lacrosse sticks, balls, and a curriculum manual. “The kids are so excited about lacrosse,” said Coach Hunt. “They want to know if we can play other schools as well!” That could be a possibility, as interest in lacrosse in schools grows. It is the fastest growing high school sport in the last ten years, according to US Lacrosse. Although the sport’s recent history includes popularity at elite New England schools, lacrosse began centuries ago in Native American culture and is considered to be America’s first sport. In those times, the game had religious significance and was even used to resolve conflicts between tribes on a field up to 15 miles wide, with games lasting for days. The game is very fast paced, with aspects of basketball, soccer, and hockey. Thank you, Coach Hunt, for going the extra mile to provide variety and excitement in Painted Rock Academy’s PE program.